This article is about war between Diponegoro and the Dutch Empire. For other uses, see Java War (disambiguation). The Java War or Diponegoro War was fought in Java between 1825 and 1830, which took place in central Java. It started as a rebellion led by Prince Diponegoro: a leading member of the Javanese aristocracy who had previously cooperated with the Dutch. The proximate cause was the Dutch decision to build a road across a piece of his property that contained his parents' tomb. Amongst other causes was a sense of resentment felt by members of the Javanese aristocratic families at Dutch measures intended to restrict the renting out of land at high prices. Finally the succession of the throne in Yogyakarta was disputed: Diponegoro was the oldest son of Hamengkubuwono III, but as his mother was not the queen he was not considered to have the right to succeed his father. Diponegoro's rival to the throne, his younger half brother, Hamengkubuwono IV, and then his infant nephew Hamengkubuwono V, was supported by the Dutch. Being a devout Muslim, Diponegoro was alarmed by the relaxing of religious observance at Yogyakarta court, the rising influences of the infidel Dutch in the court, as well as by the court's pro-Dutch policy. Among Diponegoro's followers, the war has been described as a jihad "both against the Dutch and the murtad or apostate Javanese." The forces of Prince Diponegoro were successful in the early stages of the war, taking control of the middle of Java and besieging Yogyakarta. The Javanese population was supportive of Prince Diponegoro's cause, whereas the Dutch colonial authorities were initially indecisive. The Javanese peasantry had been adversely affected by the implementation of an exploitive cultivation system, which required villages to grow export crops to be sold to the government at fixed prices. As the Java war became prolonged, Prince Diponegoro had difficulties in maintaining the numbers of his troops. The Dutch colonial army, however, was able to fill its ranks with indigenous troops from Sulawesi, and later on with European reinforcements from the Netherlands itself. The Dutch commander, General de Kock, raised the siege of Yogyakarta on 25 September 1825. Prince Diponegoro then began an extensive guerrilla war. It was not until 1827 that the Dutch army were able to gain the upper hand through the deployment of mobile detachments of colonial troops, based in a number of small forts located throughout central Java. It is estimated that 200,000 died over the course of the conflict, 8,000 of these being Dutch. The rebellion finally ended in 1830, after Prince Diponegoro was tricked into entering Dutch controlled territory near Magelang, believing he was there for negotiations for a possible cease-fire. He was captured through treachery and exiled to Manado and then to Makassar, where he died in 1855. Because of heavy losses amongst the Dutch forces, the colonial government decided to enlist African recruits in Gold Coast: the so-called "Belanda Hitam" ("Black Dutchmen"), to augment its East Indian and European troops. 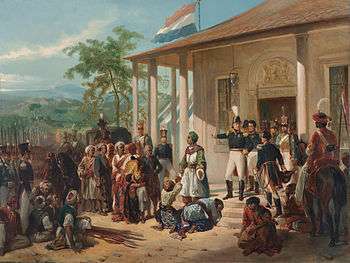 Although the war had severely exhausted the Dutch finances, the pacification of Java enabled the colonial government of Dutch East Indies to implement Cultuurstelsel ("The Culture System") in Java, without any local opposition. Implemented in 1830 by the new governor general, Johannes van den Bosch, this cultivation system requires 20% of village land had to be devoted to government crops for export or, alternatively, peasants had to work in government-owned plantations for 60 days of the year. The policy brought the Dutch and their native allies enormous wealth through the export of cash crops. It brought the Netherlands back from the brink of bankruptcy, and made the Dutch East Indies a self-sufficient and profitable colony. Wikimedia Commons has media related to Java War. 1 2 Toby Alice Volkman: Sulawesi: island crossroads of Indonesia, Passport Books, 1990, ISBN 0844299065, page 73. 1 2 Jaap de Moor: Imperialism and War: Essays on Colonial Wars in Asia and Africa, BRILL, 1989, ISBN 9004088342, page 52. ↑ Renate Loose, Stefan Loose, Werner Mlyneck: Travel Handbuch Bali& Lombok, CQ Press, 2010, ISBN 0872894347, page 61. ↑ Dan La Botz: Made in Indonesia: Indonesian Workers Since Suharto, South End Press, 2001, ISBN 0896086429, page 69. ↑ J. Kathirithamby-Wells (1998). "The Old and the New". In Mackerras, Colin. Culture and Society in the Asia-Pacific. Routledge. p. 23. Carey, P.B.R. Babad Dipanagara: an account of the outbreak of the Java War (1825–30): the Surakarta court version of the Babad Dipanagara Kuala Lumpur: Printed for the Council of the M.B.R.A.S. by Art Printing Works, 1981. Monograph (Royal Asiatic Society of Great Britain and Ireland. Malaysian Branch); no. 9. MC Ricklefs, A History of modern Indonesia since 1300, 2nd ed, 1993, pp. 116–17.